EDITOR’S NOTE: Mexico has repeatedly accused the United States of mistreating Mexican immigrants — legal or otherwise. But immigration experts in Mexico say that accusation is hypocritical. They charge the treatment of Central American immigrants entering Mexico, almost always on their way to the U.S., is much worse. COATEPEC, Veracruz, Mexico — Almost every night in Mexico’s south, it’s hot and humid and the acrid aroma of sweat and diesel that powers the train fills the air. A cloud of mosquitoes is so thick you barely make out the lights of a freight train they call La Bestia, The Beast, as it approaches on its way north. “This is the path of death in Mexico,” Guillermo Ramirez said in Spanish. He runs a Casa de Migrantes, a safe house for Central American migrants right beside the train tracks. La Bestia is now only a few feet away. Shadows move across the tracks. A group of undocumented men and women from Honduras and Nicaragua whom Ramirez has sheltered from Mexican police and extortion gangs gets ready to jump on the train. The Mexican government claims 400,000 Central and South Americans cross illegally into Mexico every year. Some are seasonal farm workers, but the vast majority are passing through on their way to El Norte, the United States. Migrants say the train is the lesser of two evils. By road, they face police checkpoints, robbers, or kidnappers who force their families to come up with the ransom. On the train, they pay bribes to armed gangs that control who gets on, and in some cases, who gets thrown off. They must also stay awake, standing, for days on end, gripping a handrail. Many migrants have fallen off, losing limbs or their life. “The train is a dangerous way to travel,” Delcia Ventura Canales said in Spanish. The 30-year-old Honduran left her husband, two sons and her parents two months before I met her in Veracruz. She said she boarded La Bestia at the Guatemalan border. She stopped here after she says she was robbed by a Mexican police officer who boarded the train. But she says being robbed is not what she’ll remember. “We saw three people die on the train. One was hit by a tree branch, the other was hit by an electric cable and the other was thrown off the train by someone,” she said. The hyper-violent Los Zetas drug gang operates along the train’s path and has kidnapped migrants numerous times. But riding La Bestia is the preferred option for many. Nicaraguan Josue Holguin Artica, 20, describes a shakedown he said he suffered at the hands of Mexican police. Holguin said he was intimidated to the point he had to bide his time before mustering the courage to try a second time to get on board the train. Holguin said he had enough money to extricate himself from a nightmarish confrontation. Migrant advocate Guillermo Ramirez said by not protecting migrants, Mexico doesn’t practice what it preaches when it comes to immigration. “We must set an example. Our president must make sure migrants coming here are treated like human beings,” Ramirez said in Spanish. Ramirez was referring to then-Mexican President Felipe Calderón. Former Mexican Congressman José López Medina is a leading voice within Mexico clamoring for change. He wants the Mexican government to decriminalize all undocumented migrants and grant them safe passage, negating the need to jump on a moving freight train preyed upon by criminals or police, sometimes both. “We claim something that we don’t practice in our own country. The Central Americans are treated worse than the way the Mexicans are treated in the United States. I feel shame, profound shame,” López Medina said. The deaths and multiple injuries might be avoidable, he told me, if Mexico granted, and enforced, safe passage for undocumented travelers, the vast majority of whom are seeking to transit Mexico and not settle there. The train picks up speed as a migrant climbs on board. If they’re lucky, migrants will reach northern Mexico and the U.S. border within two weeks. Nicaraguan Josue Holguin Artica, 20, inside a safe house called Casa de Migrantes. He’s been hiding out here for a month with other migrants from Guatemala. Holguin waits on the tracks with his friend Manuel Ortega as La Bestia, the freight train they’ll board heading north, approaches. A migrant from El Salvador who says he walked for three nights evading police checkpoints to reach Veracruz rests in the Casa de Migrantes. Another freight train is expected to arrive within days. The man says he will get on board. 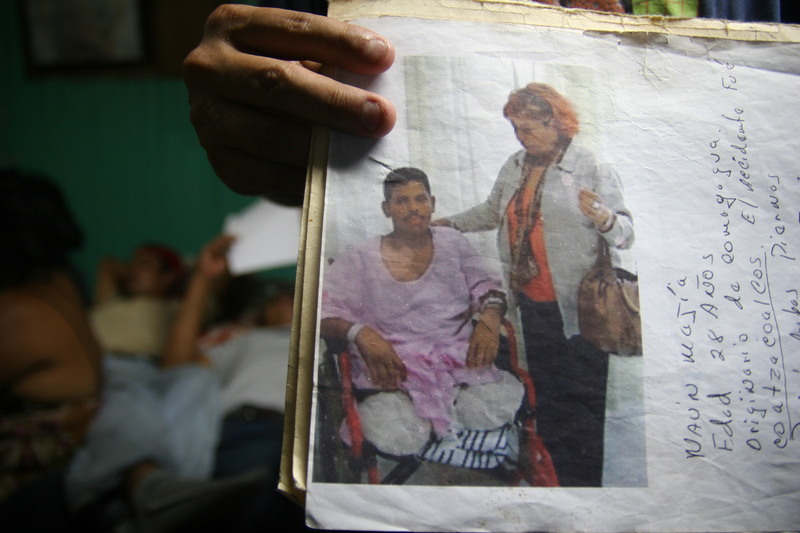 Untold numbers of Central American migrants have lost limbs, or their life, after falling or being thrown off La Bestia. 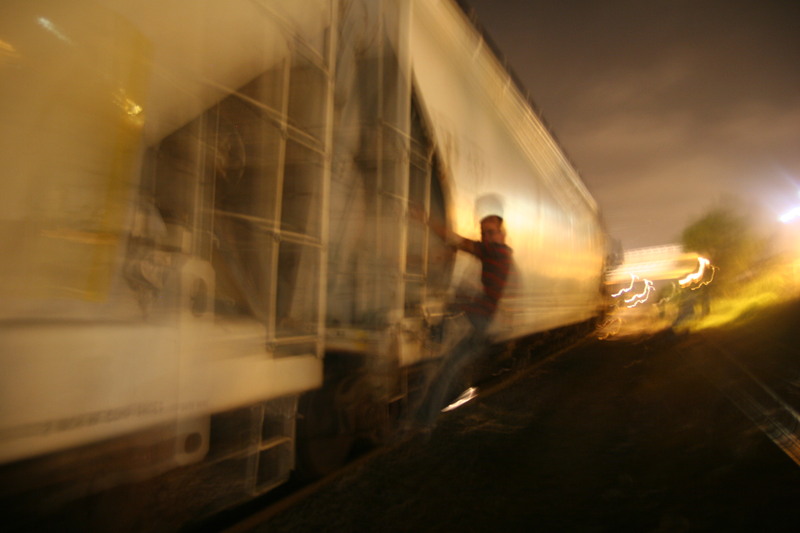 Shadows move across the tracks as La Bestia, the train known as The Beast, approaches from the southern Mexican state of Chiapas into the state of Veracruz.